1. I’m grateful Brian had a successful business trip and arrived home safe. I miss him when he’s gone. 2. I’m grateful Linda was available for a spontaneous walk and chat. When our kids were little we spent a lot of time together and lately it seems difficult to do. We make plans, have to cancel and remake them. I wanted to take a walk in the park, called her and she was free. Planning is good, but sometimes spontaneous is better. 3. I’m grateful Live, Laugh, Louise will be opening soon in Seaford and will be carrying Alegna Soap® products. The store will all be Long Island made handcrafted items. Stay tuned for the Grand Opening! 4. I’m grateful I was off from my day job on Wednesday and I had time to go down to the beach. 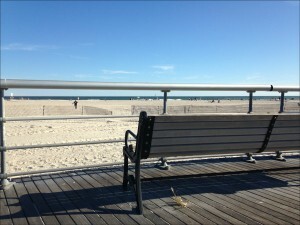 I walked the boardwalk and sat on a bench when I was done. It was relaxing and peaceful and just what I needed. I like your grateful lists. Glad to hear a store like that is coming to Seaford. I will have to check it out, best wishes with it. I am grateful for a fresh new week to write a new history in. I love new beginnings too Kayla. I’m grateful to read your gratitude list that reminds me that I need to be grateful. Even for the mean and nasties we come across in life. They’re good practice. I’m grateful for the man that taught me about planned spontaneity! All great things to be grateful for Gay! Thanks for sharing. Congrats on that new store carrying your line. Your grateful lists give me a glimpse into your life and make me appreciate mine. What a great name for a store. Good luck. I especially like #5. Good manners are so easy but so lacking in today’s world. The shop is owned by 2 friends and they are both named Louise. It is a great name. I’m grateful that I can look back at the month of September and see progress toward my personal goals. I have been more effective and efficient this month. And I’m grateful for that! Thanks for sharing Carrie! And congrats! What a wonderful list of gratitude. I and always grateful for caring friends.